Richard Cleaver in front of Hurricane BG882, in which he claimed a B5N on 9 April 1942. Image kindly provided by Robert Walker. Cleaver was born in 1919 and was from Pontypool, Monmouthshire. On 15 April Flying Officer Cleaver and two airmen arrived at Habbaniya, Iraq, with three Fairey Gordon biplanes. Cleaver was to serve as at flying instructor at this base. In April 1941, seizing the opportunity of Allied reverses in Greece and in North Africa, a pro-Axis coup led by Rashid Ali took place in Iraq. Invoking longstanding agreements Imperial troops were landed at Basra at the head of the Red Sea. In reprisal on 29 April, a 9000-strong Iraqi force invested the large RAF base at Habbaniya, to the west of Baghdad. 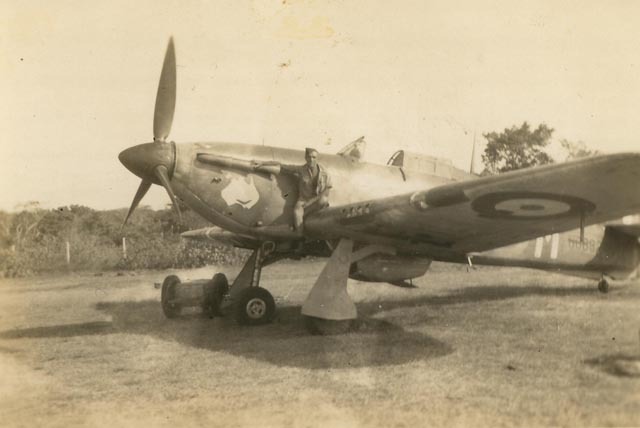 At this time some reinforcements of the flying training school there had taken place, including the delivery of six Gladiator Mk.Is (from stocks in Egypt) that joined three other Mk.Is on 19 April in a Fighter Flight under the command of Flight Lieutenant R. S. May. The Fighter Flight was to operate from the base’s Polo Field. Flying Officer Cleaver was at this time part of the Fighter Flight. Following the refusal of the Iraqi troops to withdraw from Habbaniya on 1 May, Air Vice Marshal H. G. Smart, Air Officer Commanding in Iraq, on receiving confirmation that the Foreign Office in London considered the Iraqi action as an act of war, now decided that he would attack the Iraqi forces at dawn on 2 May without prior warning. In the morning on 2 May British aircraft attacked the Iraqi positions around Habbaniya and in response the Iraqis started to shelling the base and by 10.00 Iraqi aircraft began to appear in strength. Several strafing attacks were made by the Iraqi air arm and, before the day was out, had succeeded in destroying three aircraft on the ground. The Fighter Flight was active during the day, Flying Officer Cleaver intercepted one of the Iraqi SM.79Bs over the base but his guns jammed after a couple of passes. Flying Officer John Norman Craigie saw a Breda Ba.65 about to start its attack run; he attacked it and caused it to break off. Both these claims were credited as damaged. On 3 May Iraqi bombers were again caught over the base by the defending fighters, Flying Officer Cleaver made three passes at a SM.79B, firing 1200 rounds; the bomber departed the area with black smoke streaming from the port engine and diving steeply for the ground. Flight Lieutenant R. S. May attacked a formation of Northrop 8A-4s, and damaged one of them. It was later discovered that the SM.79B and the Northrop had both force-landed in the desert; subsequently both the pilots had their claims upgraded to confirmed victories. 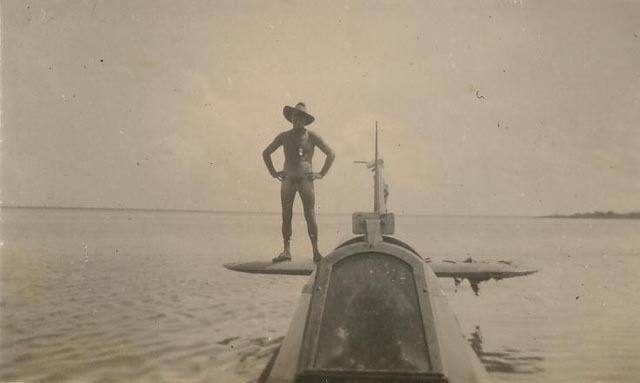 In June 1941 he was part of ‘X’ Flight, which had formed at Habbaniya on 6 June. This unit was equipped with Gloster Gladiators under the command of Flying Officer K. H. O. Young and had been formed to take part in Operation’Exporter’, which was an invasion in French-held Syria. The unit’s Gladiators were twice involved in successful engagements with French Dewoitine D.520s, and several of these were shot down. Not all the names of the successful RAF pilots involved have been discovered, and it is possible that Cleaver may have been one of these, but this can not be confirmed. Following the occupation of the Iranian oilfields in August, he moved to 261 Squadron where he became ‘A’ Flight commander. With this unit he went to Ceylon following the Japanese entry into the war. In the early morning on 9 April, 91 B5Ns from the carriers Soryu, Hiryu, Akagi, Zuikaku and Shokaku led by Commander Fuchida and escorted by 41 A6Ms from the same carriers and led by Lieutenant Commander Itaya were out to attack Trincomalee port and China Bay airfield. 261 Squadron was scrambled and at 07.10 Cleaver (Hurricane BG882) scrambled with six ‘A’ Flight Hurricanes. The flight reached 21,000 feet but, although they could see the bombs bursting in the harbour, they were unable to spot the Japanese aircraft. Cleaver then took the opportunity to lead the formation out to sea and get the sun behind them and, having done this, they spotted a formation of bombers at about 12,000 feet. The Hurricanes began diving towards these then, seeing that AA fire was heavy, they drew off and waited for the bombers on their way out. Cleaver dived steeply and fired at the third aircraft in the first formation before climbing away and losing his section. The flight lost two Hurricanes (both pilots safe) in this attack while climbing two damaged, which dived away smoking. Cleaver meanwhile, finding himself alone, dived back at the formation he had originally attacked and opened fire on the No. 2 aircraft, but was attacked by a fighter and lost his target. He evaded his assailant and spotted some more bombers making out to sea; flying parallel with them, he overtook before turning to make attacks on the second and third aircraft. The latter fell out of formation pouring white smoke and he reported that it went into the sea. He then observed a large dogfight over Foul Point and attacked an A6M, which was on the tail of a Hurricane, closing to 200 yards and opening fire. Before he could observe any result however, he was attacked by four more fighters and retired with 20 hits in the fuselage of his aircraft, returning then to base. In this big and confusing combat over-claiming were heavy. 261 Squadron claimed four A6Ms and four B5Ns, plus one B5N and three A6Ms probably destroyed and one A6M and at least five B5Ns damaged. Of 16 Hurricanes taking part eight were shot down and either crashed, or force-landed on China Bay airfield with three more were damaged. The Japanese fighters claimed 38 Hurricanes (and 14 shared), 2 probables (and 1 shared) and 1 floatplane plus several on the ground. Three A6Ms were lost and two B5Ns with seven more bombers damaged. The Japanese D3As from the carriers then attacked and sank the British carrier HMS Hermes and the Australian destroyer HMAS Vampire south of Trincomalee. 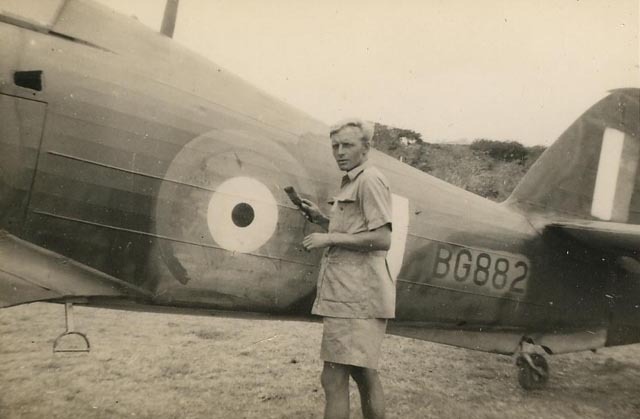 Squadron Leader A. G. Lewis was wounded during the day and hospitalized and Cleaver took over command over 261 Squadron, which at the end of the day had five Hurricane IIBs and one Mark I left serviceable. Sergeant L. W. Hickman on the wing of Hurricane BG882 in which Richard Cleaver claimed a B5N on 9 April 1942. Hickman was part of the ground-crew of this aircraft. Sergeant L. W. Hickman on the tail of one of the Hurricanes that were damaged and crash-landed after the combat on 9 April 1942. 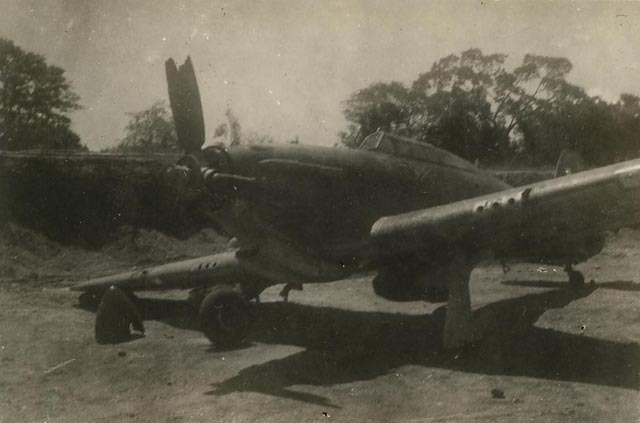 A shot up Hurricane after the attack on Trincomalee on 9 April 1942. Cleaver saw no further action in the Far East, but later returned to the UK. In summer 1944 he joined 611 Squadron as supernumerary Squadron Leader. In the morning on 19 June whilst engaged in a patrol over the Normandy invasion beaches, his Spitfire Mk.Vb (BL520) crashed into the sea, killing him. No corresponding Luftwaffe claims has been found. At the time of his death Cleaver was credited with 1 biplane victory and a total of 2. Biplane victories: 1 destroyed, 1 damaged. TOTAL: 2 destroyed, 1 damaged. (a) First claimed as a probable but later upgraded to a confirmed. (b) Claimed in combat with B5Ns from the carriers Soryu, Hiryu, Akagi, Zuikaku and Shokaku. 261 Squadron claimed four A6Ms and four B5Ns, plus one B5N and three A6Ms probably destroyed and one A6M and at least five B5Ns damaged while losing eight Hurricanes and getting three more damaged. The Japanese fighters claimed 38 Hurricanes (and 14 shared), 2 probables (and 1 shared) and 1 floatplane plus several on the ground. Three A6Ms were lost and two B5Ns with seven more bombers damaged. Gloster Gladiator Home Page - Alexander Crawford. Additional info kindly provided by Alexander Crawford and Robert Walker.